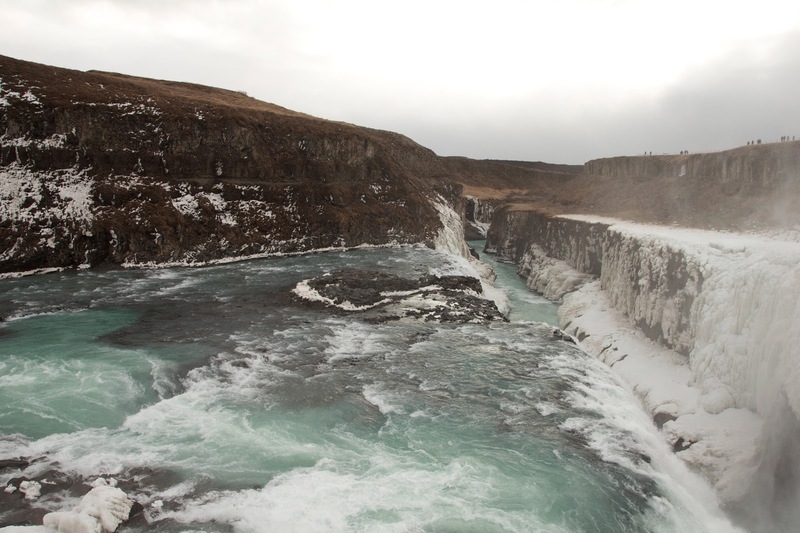 We take a change of pace today and embark on a bus tour for a shortened version of the popular Golden Circle Tour. Instead of taking the full tour which would take much longer, we visited 3 sites today: Geysir, Gullfoss and Þingvellir. 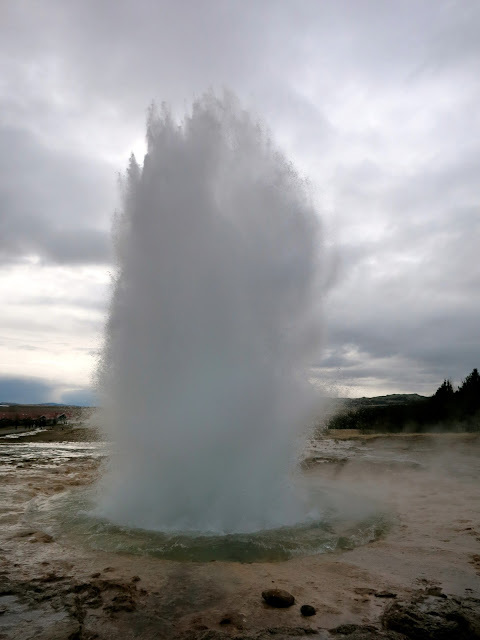 The first stop is the area where we find Geysir and Strokkur. Geysir is the original fountain geyser which all geysers have been named for. It's no longer as active as it used to be so we do not expect to see any eruptions from it. However, we do have the opportunity to witness one of Iceland's most famous geysers, Strokkur. Strokkur impressively erupts for us every 4-8 minutes around 20 m high. Both Strokkur and Geysir are fountain geysers found in a part of the Haukadalur geothermal area where you would find other geothermal features such as mud pools, fumaroles, algal deposits and other geysers around it. The most notable feature is the steam rising out from the ground. After I return home, I'll be editing a video clip of an erupting Strokkur. It's impressive to watch because a large bubble forms over the centre and seconds later, the hot water of the geyser goes shooting through the air. It's truly an impressive occurance of nature to witness in person. Our next stop is the "Golden Waterfalls" called Gullfoss. This natural waterfalls is another stunning display of water interacting with the earth. In some ways, similar in appearance to Niagara Falls (the Canadian portion because let's face it, it's the better side) but in its own ways even more majestic and amazing. The waters are not clear because of the sediment that is carved up from the glaciers making it murky brown--though today it looked pretty clear to me. This waterfall has an interesting history of a young woman named Sigríður Tómasdóttir who fought to keep the falls natural. Our final site is a UNESCO World Heritage Site called Þingvellir. The site is of a historical, cultural and geological significance for Iceland. 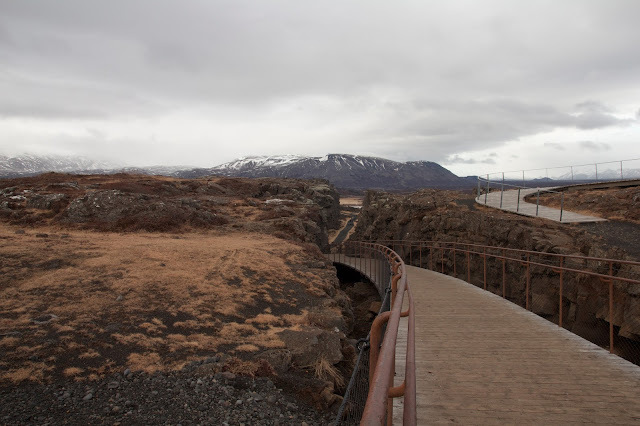 First, this area is near one of the more active volcanic areas of Iceland, Hengill which is part of the Mid-Atlantic Ridge--the North American and Eurasian tectonic plates meet along this long mountain range. It is here where we realize that Iceland is actually widening (or perhaps splitting down the middle) because these two plates are actually moving away from one another. Historically and culturally, this is the site of the first parliament structure of the Icelandic people who had been meeting here regularly, to sort out laws, disputes and other matters. We weren't given a lot of time to look around and really discover the area but it's another UNESCO Heritage World Site. Perhaps later in the week when we have the opportunity to rent a car and drive the Golden Circle ourselves.